For asset owners, AQURON 7000’s PERMANENT PROVEN concrete restoration repair solution and protection halts structure deterioration and results in zero maintenance. An ongoing monitoring service is available and application shows significant cost/benefits vs repetitive remedials. 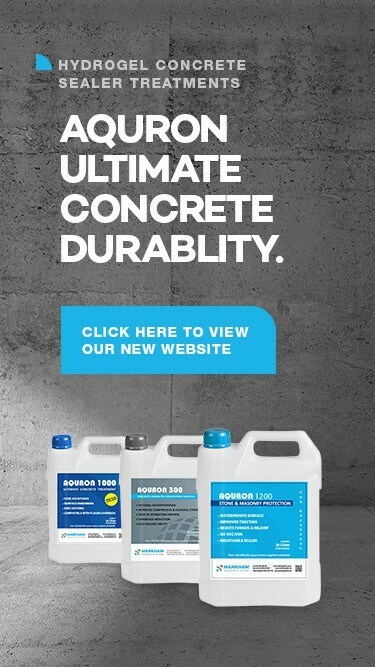 Long-term Durability of concrete is extended, backed of the AQURON project specific guarantees. Incipient Anode syndrome, where corrosion breaks up beside repair, is a simple example of why concrete repairs alone are not the ANSWER. But concrete repairs combination with AQURON give assets owners a completely new approach to protecting their valuable assets. AQURON 7000 is an Easy-fix Solution for any project that has insufficient concrete cover. Permanent Concrete Waterproofing - Aquron 7000 Concrete restoration repair solution for Waterproofing Concrete transforms moisture and produces a hydrogel throughout porosity making the concrete internally waterproof. AQURON waterproofing being inside the concrete cannot be worn or abraded off, and is as permanent as the concrete itself.